Broken capillaries are most often found on either the legs or the face. While spider veins on the legs can cause great discomfort, those who have them on their face can find them hard to cover with makeup and find them very embarrassing and unsightly. Though treatable with a laser, the skin of the face is so thin it is the most difficult place to treat. The best thing is to think preventative and never have them appear in the first place. Heredity and Age – This is the one factor we have no control over. Unfortunately, aging is inevitable and having a family history of spider veins cannot be changed, but it’s important to be aware of such things and how they may affect you as you get older. 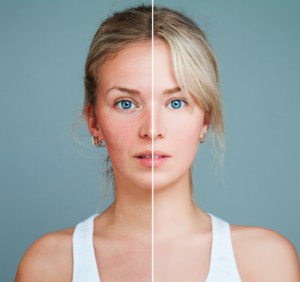 Conditions like rosacea, a chronic skin condition resulting in swelling and redness, are passed down through genes, so your chances of having rosacea are far greater if even one of your parents has suffered from it in the past. The presence of such conditions will only become more visible as you age because your skin becomes thinner and more transparent over time. It’s important to know whether your family history makes you more prone to facial spider veins, as this knowledge can make you more careful in your day-to-day health. People who have problems with alcoholism will also often have problems with spider veins. Overconsumption over long periods of time can lead to high blood pressure, which dilates the veins throughout the body and most visibly in the facial region. Many years of alcohol abuse can cause this dilation to remain open and even lock in place, causing irreversible damage to the fragile vascular network of the face. And while treatment for spider veins is available, most insurance companies consider these techniques to be strictly cosmetic. Thus, treating facial spider veins can be very costly, and, because the complete removal of spider veins is nearly impossible, even after multiple treatments, patients are often disappointed with their results. Trauma and injury to the skin can cause the appearance of facial spider veins, further promoting the need to wear sunscreen whenever you are spending prolonged periods of time in the sun. The tiny capillaries in the face are so delicate, that even scrubbing the face too vigorously during cleansing can cause the capillaries to expand too much and break, leading to the appearance of bruise-like spider veins. Unfortunately, unlike typical bruises found other places on the body, these “bruises” will never heal, at least not without medical treatment. Even washing your face with water that is too hot can have this result, so it’s important to be both gentle with your skin and protective of it as well. If you do already have spider veins beginning to show, call us or schedule an online screening as soon as possible. The longer you wait for the harder and more costly it becomes to treat. At West Florida Vein Center, our goal is to educate you regarding venous disease and empower you by offering a confidential venous evaluation from the comfort and privacy of your home. Visit www.westfloridaveincenter.com.